You can show the application icon as a shortcut on the home screen to allow the user to easily launch the application. In the device application list, you can show a badge with the application icon to provide additional information about the application state or notifications to the user. To create a badge for an application, create an instance of the Tizen.Applications.Badge class. The parameter defines the application for which the badge is added. If the application is adding a badge for itself, the parameter can be null. If an application not signed with the same certificate must be allowed to manage a badge, use the Add() method of the Tizen.Applications.BadgeControl class with a writable application ID. The writable application ID enables another application to control your application to manage the badge. You can also configure your application to handle the badge itself. To remove the badge from the application, call the Remove() method. The only parameter is the ID of the application whose badge is to be removed. 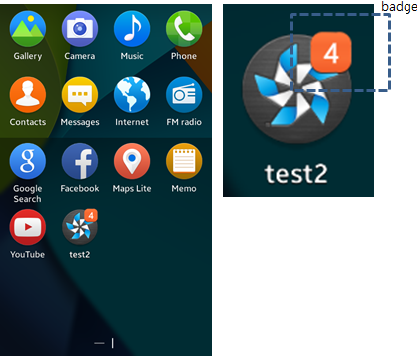 Retrieve the badge count and visibility with the Find() method of the Tizen.Applications.BadgeControl class. The values are stored in the count and visible properties of the Tizen.Applications.Badge class. The badge count is displayed in the upper-right corner of the badge and the count property value must be an integer. The visible property value is of the Bool type. 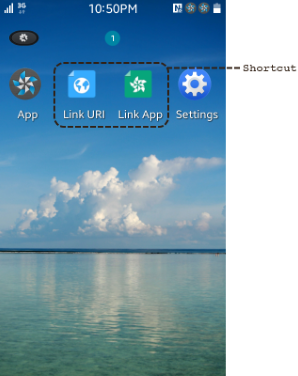 Define the shortcut details (such as its name, icon path, and whether duplicates are allowed) with the properties of the Tizen.Applications.Shortcut.HomeShortcutInfo class. If you set the Uri property, clicking the shortcut opens the URI. If the Uri property is not set, clicking the shortcut launches the application that set the shortcut. Before adding a widget to the home screen, a widget application must be prepared. To add a widget, you must know the widget ID and supported sizes.